You have been asked and accepted a proposal of marriage or decided together that it is time. Now the next steps in planning will include getting the license. This is a guide about getting a marriage license. We want to get married, but my boyfriend is not from this state and does not have ID. What kind of paperwork does he need for the marriage license? Why not call or visit your city hall and ask the clerk what the paperwork requirements are to get married? Then you will have the most accurate answer straight from the horses mouth. You should be able to find the phone number for city hall in your phone book. 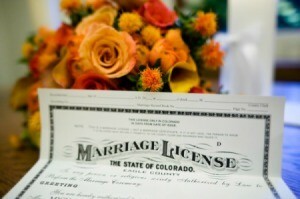 I would be very leery of marrying someone from another state who has NO ID. How do you know who he is? Just from what he tells you? Be careful! I too, would be very leery. If he doesn't have an ID he must not work. It sounds like you probably don't know much about this person other than what's he's telling you. Has he explained to you as to why he doesn't have an ID? I see a disaster in the making. Please be careful! You want to marry someone whose relatives you have not met, whose back ground you don't know, who can't prove who he is. Honey if he was an ax murderer how would you know? Has he been in prison? Has he been married before? Is he divorced? Does he have children that he owes child support for? Believe me dear, he has ID, he just doesn't want you to know about it. He is already conning you and you want to marry him?